For instance, I was raised a particular Christian faith and still am, but I am Jewish from my mom. But it is fun, and it is fun to celebrate, and it is spring! 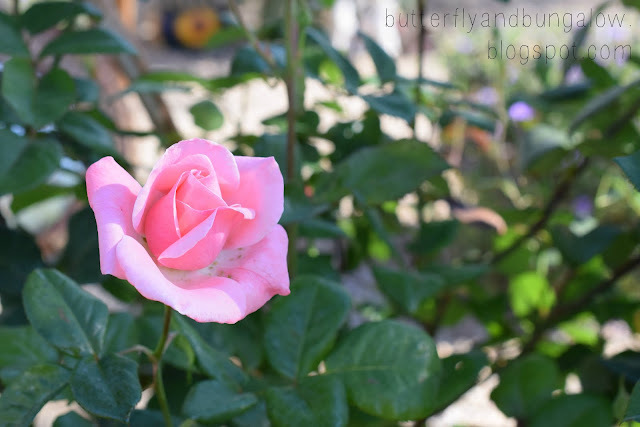 The roses in our garden are in full bloom and the citrus is blooming. The air smells wonderful, the birds are singing, and some of us are sneezing. We bought faux plastic Easter eggs. Some left over from last year, and some from Target: 6 for 1.50. 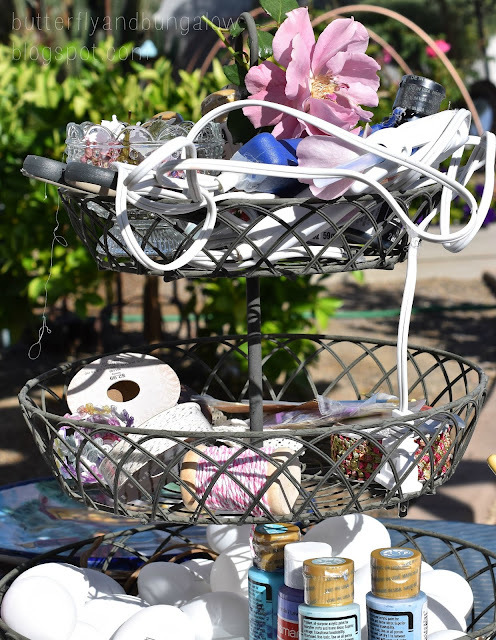 We like to use this tiered basket for so many things, but it's perfect for a party like this, because all the supplies can be in one place on the table. Keep in mind these are young teen girls. Actually you can use anything around the house... I didn't buy anything except the faux eggs. These were leftover from our butterfly wreaths. The girls came up with some cool designs like cracked eggs, flower pots, and Tsum Tsum like characters for instance, Winnie the Pooh, which they kept for themselves, so no photos of some incredibly creative ideas. Here are some that went on the porch. I placed some of them on the porch. Even cats like to participate. An often searched Easter post of ours is here. When we were done we had raspberry mousse cake that I picked up from the bakery and imported lavender soda. Unfortunately no photos only with the phone, so maybe later on Instagram. I still have it set up, so I know what I will be doing more of today. Your eggs are works of art! They are very original and elegant. I like very much the way you displayed them. your crafts are lovely. I find it inspiring to stop by and see what you're up to. 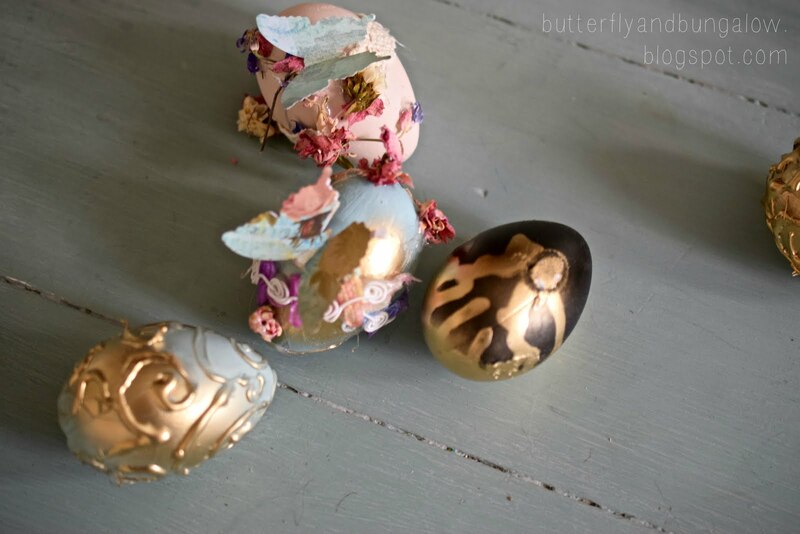 Oh Su how perfectly artsy and personally expressive your Easter eggs are, I see color's from Florence in them, the butterflies adding the touch of magical whimsy. 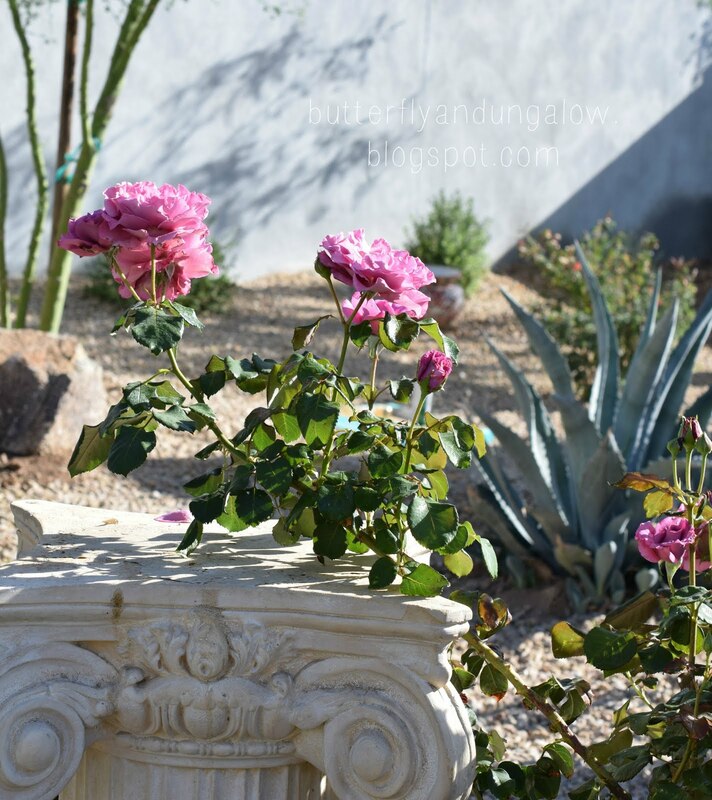 Love your garden with your beautiful roses. Just took the tours from your rooms and enjoyed revisiting them. Have a wonderful Sunday my friend. I forgot - where did you find Lavender soda, I'm off to google it, how delightfully refreshing it must be. That looks like a lovely thing to do with the girls - and the results are beautiful! They are gorgeous! I love that you can let your imagination go wild! And no two will ever be alike. I would love to make some too! Happy Spring! Your eggs are quite artistic!! Gorgeous! What a fun party! Love the gold on some of them. So pretty and springy! Looks like a very fun party and I am interested in seeing the treats. Imported lavender soda? I had no idea that there was such a thing! Have I wandered into the garden of Faberge? Truly lovely creations and what must have been a time of fun for all! The eggs are truly works of art. I so appreciated your comment about anyone can participate no matter what faith. I think it is wonderful when we can recognize and share in the beliefs of our friends even if they are different than our own. One of my favorite videos is one that was on facebook a while back of a Jewish woman singing "Jesus Loves Me" to a woman with late stage Alzheimer's disease and the joy on the face of the Christian woman. What beautiful eggs! 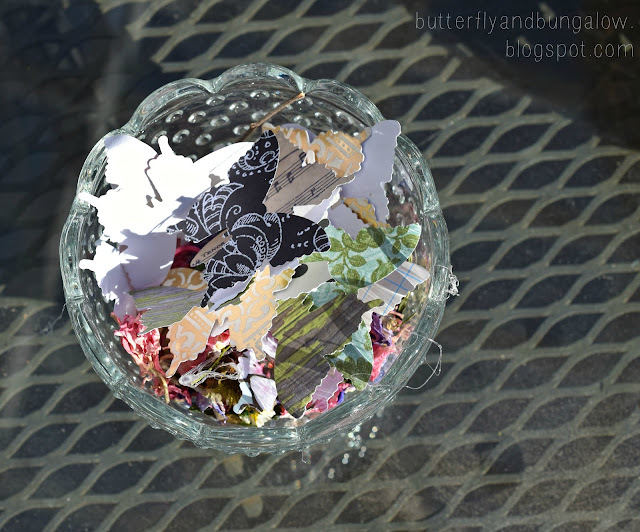 I haven't done any Easter crafting yet and I need to get busy with the Easter baskets. The eggs are incredibly beautiful! How impressive! This is a wonderful idea, Su. Thank you for sharing. Oh Su , your eggs are amazing, I better hurry and try some before Easter has passed. Love how they take on such art as gold leafing and paper mâché and the paint tones are intriguing. Beautiful wonderment here as always. wunderschön schauen diese Eier aus, eine sehr schöne Idee. Die Fotos sind zauberhaft. Vielen Dank. Die Party war eine Menge Spaß . Frohe Ostern. Ich folgte ihr auf Instagram . How fun! 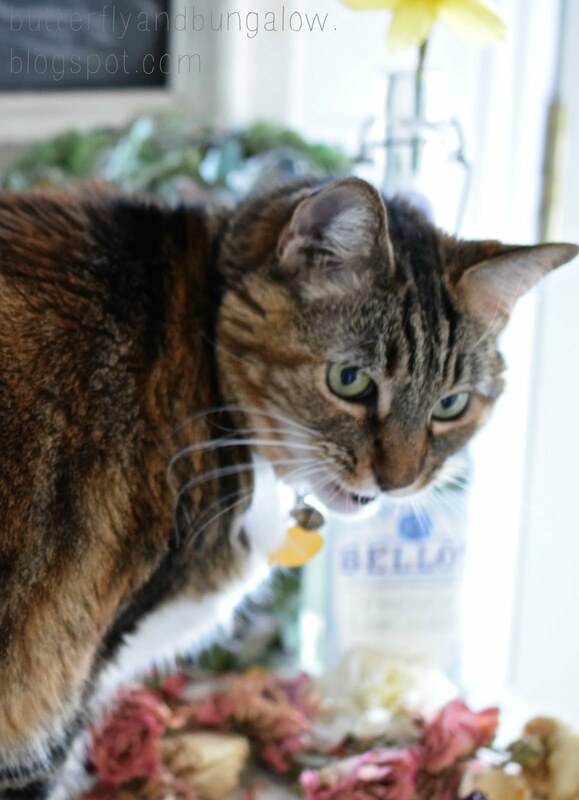 Just curious, looking at the kitty picture, do they like to play with your pretty vignettes? Thank you, Kathleen. That is what she is doing; especially this one. I placed some of the colored eggs in the dried flowers, and she jumped up on the console and began pushing things around with her nose and accidently knocking flowers on the floor. The most important supply of all...imagination. You both certainly have enough of that! Lovely! Oh... you should have seen my expression when I saw the eggs! They.are.gorgeous!! What a fun day and they eggs are gorgeous and creative! Works of art Su. So pretty. 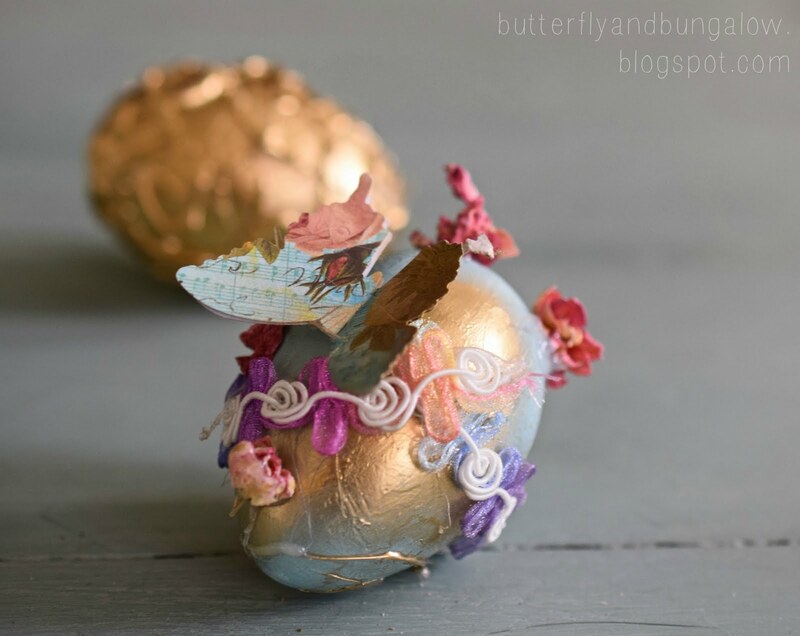 Stunning, truly stunning your decorated eggs, they left me in awe, my sweetest Su, thank you for sharing them with us ... And I wonder the fun for participating to such a party, as well, that's a wonderful idea for Easter ! Amazing garden party to decorate Easter eggs! What a lovely way to enjoy your garden & a fun tradition! That looks like fun!! I love that silver and gold one best!! Hi Su! Your eggs are stunning! Gathering together to be creative is always so much fun! What a fun idea for a party. 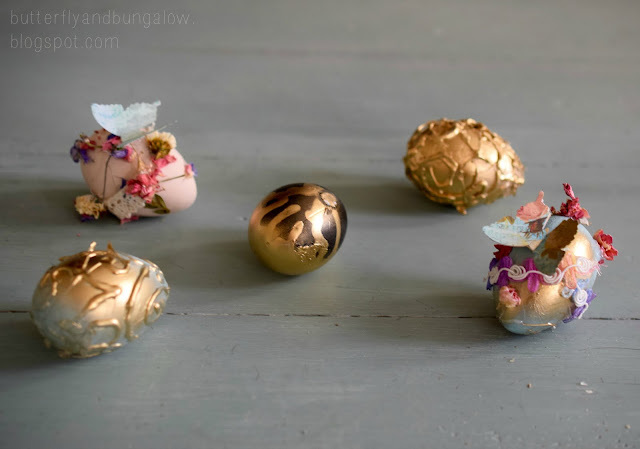 The eggs are pretty, and I'l have to hop over to Instagram to see more. 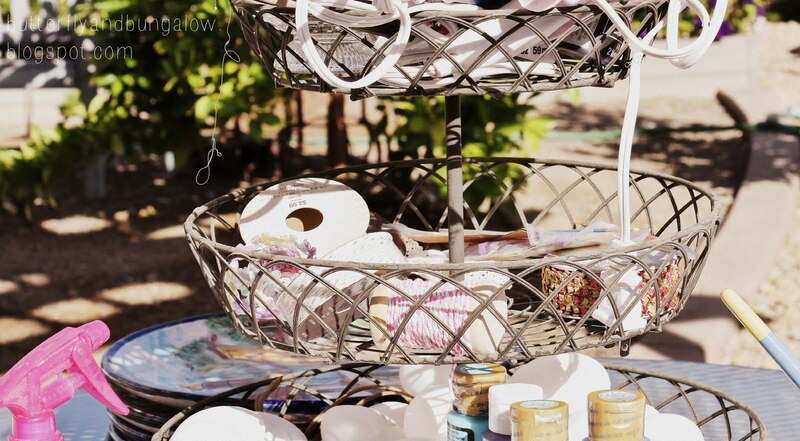 A crafting garden party is my idea of heaven. And the eggs are fantastic! The eggs are beautiful. The butterflies are a nice touch. Such beautiful eggs Su! I've included this project in my Shabbilicious Easter Egg round up for the Shabbilicious Friday Link Party tomorrow. Everything is so sweet and light. We are just heading into SpRiNg here, lots of very green grass and bright daffodils. Loving the roses, wish I had a place to grow some. Wow!! !Your Easter eggs are absolutely delightful! I love the butterflies detail! Lovely sweet cat photo! Your photography is gorgeous. So are the eggs. Happy Easter! Beautiful eggs! They're so elegant! 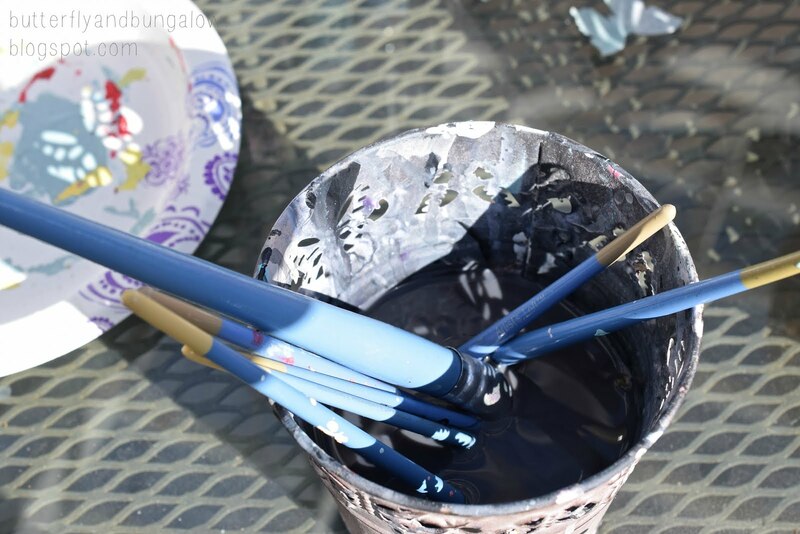 It sounds like the perfect afternoon to be out in your garden creating art with teenage girls. We've still got snow on the ground! 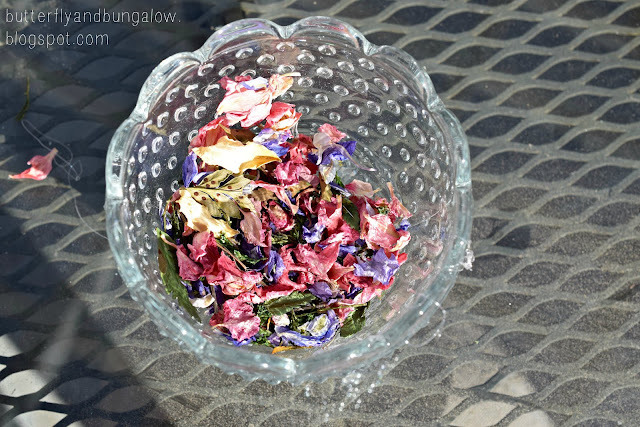 Your homemade potpourri is really lovely, too. 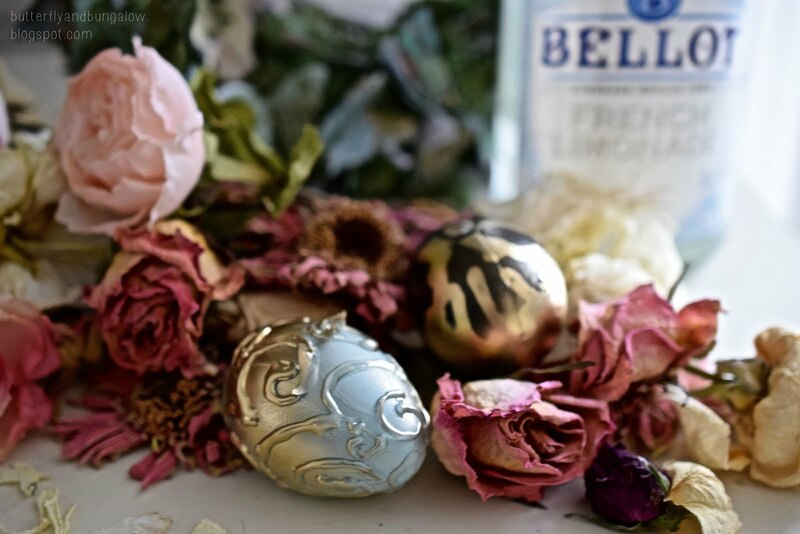 Your eggs turned out so chic!